If you need heating and air conditioning service, installation, or repair in North Alabama or Southern Tennessee, turn to Randy Wray’s Heating and Cooling. We offer many choices when it comes to heating and cooling for residents of Ardmore, Athens, Madison, and surrounding areas. Randy Wray’s Heating and Cooling services all makes and models of HVAC systems. We stand behind our work, and we prove it by offering a minimum of 1 year parts and labor warranty on all repairs. Your HVAC system represents a substantial investment, and you can trust Randy Wray’s Heating and Cooling to keep it running properly and efficiently with one of our service agreements. If you do have a problem, you’ll know that we’re here to make it right with our 24-hour emergency service. Proper climate control helps you and your family feel more comfortable and breathe easier. Randy Wray’s Heating & Cooling is a certified American Standard dealer. 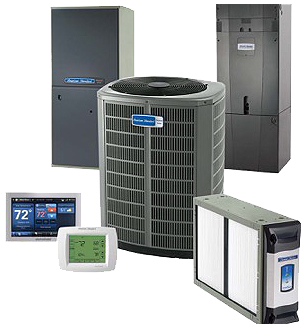 American Standard offers heating and cooling systems for residential and light commercial structures. When you select an American Standard system from Randy Wray’s Heating and Cooling, you know you’re getting a quality product with quality installation. We stand behind our work, and we prove it by offering up to 12 year parts and labor agreement.